The disposal of solid wastes has become a serious problem almost everywhere in the world. In general the more affluent a society, the more solid waste it generates. Technologically-advanced civilizations tend to produce many wastes that are not biodegradable, further complicating the disposal problem. With each succeeding decade, Mexico faces greater and more complex challenges in managing its solid waste. In terms of weight, the vast majority of solid waste is produced by the agricultural sector. Fortunately most of this waste in readily biodegradable and is produced in areas of relatively low population density. However, agricultural wastes in the form of fertilizers and pesticides which are carried into steams and rivers have significant impacts on water quality. Animal wastes from concentrated feed lot operations are another major concern particularly because they are often located relatively close to densely populated areas. Municipal solid waste includes waste from most commercial establishments and many small industrial operations. 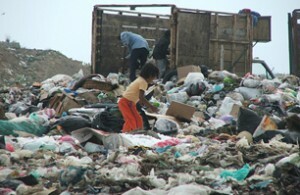 Mexico’s urban waste exceeds 36 million tons a year, three times the equivalent figure for Canada. Many municipalities in Mexico have initiated recycling programs, primarily focused on aluminum, glass, certain plastics and paper. However, in 2008 only 3.3% of Mexico’s total urban waste was recycled. Waste from larger towns and cities, about half of the total, is deposited in properly operated sanitary landfills. Waste from smaller communities often ends up in dumps, two thirds of which are uncontrolled. The management (treatment or recycling) of hazardous wastes has improved greatly in recent years, particularly in the states of Nuevo León, Tamaulipas, Mexico, Tabasco and the Federal District. About half of all hazardous waste originates either in the state of Chihuahua (31% of the total) or in Mexico City (17%). This is an excerpt from chapter 30 of Geo-Mexico: the geography and dynamics of modern Mexico. Buy your copy today, and learn more about Mexico’s fascinating geography.